The perfbeat outoftolerance is logged against various process. In the above example, the task running is garbage collection and flush. This can be hfscheck, backup, restore and so on. Ideally, you will see this logging whenever that particular task has slow performance, causing the respective maintenance or backup jobs to take a long time to complete. If you are in a situation where the backup or restore or any Filesystem check is taking suspiciously long time to complete, then this would be a best place to look. On a high level, GSAN measures the current performance over a period of previously measured average performance. > If the VM level checks out, then see if there are any issues on the DAVG or the VMFS file system. Perhaps there are multiple high I/O VMs running on this storage and there is a resource contention occurring? I would start with the vobd.log and vmkernel.log for that particular datastore naa.ID and then verify the Device Avg for that device. > If this checks out too, then the last part would be the storage array itself. Moving VDP to another datastore is not an ideal test since these appliances fairly large in size. 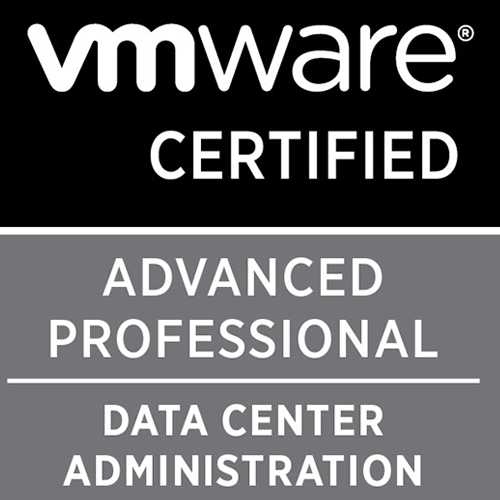 Unable To Pair SRM Sites: "Server certificate chain not verified"
So first things first, as of this post, you might know that I have moved out of VMware and ventured further into backup and recovery solutions domain. Currently, I work as a solutions engineer at Rubrik. This article will briefly explain only on the embedded Platform Services Controller deployment model. Similar logic needs to be extrapolated to the external deployments. I will be simplifying this KB article here for reference. Before proceeding have a powered off snapshot of the PSC and vCenters involved. This command will give you the ssl Trust that is currently stored on your PSC. Now, consider you are using an embedded PSC deployment on production and another embedded deployment in DR (No Enhanced Linked Mode). In this case, when you run the above command, you are expected to see just one single output where the URL section is the FQDN of your current PSC node and associated with it would be its current ssl trust. This is the current ssl Trust that is used by your deployment post the certificate replacement. Here look at the extract which speaks about the certificate chain. So from here, the chain obtained from the first command (current ssl trust in PSC) does not match the chain from the second command (Actual ssl trust). And due to this mismatch you would see the chain not verified message in the UI. To fix this, the logic is; find all the services using the thumbprint of the old ssl Trust (step 1) and update them with the thumbprint from step 2. The steps in KB article is a bit confusing, so this is what I follow to fix it. A) Copy the SSL trust you obtained from the first command to Notepad++ Everything that starts from MIID... in my case (No need to include SSL Trust option in it). D) Save the Notepadd++ document as a .cer extension. This will export the current certificate to the /certificates directory. Note: Once you paste the thumbprint in the SSH, remove any extra spaces before and after the beginning and end of thumbprint respectively. I have seen the Update service fail because of this as it picks up some special character in few cases (Special characters that you would not see in the terminal) So remove the space after fingerprint and re-add the space back. Do the same before the --certfile switch too. Re-run the commands in step 1 and 2 and the SSL trust should now match. If yes, then re-login back to the web client and you should be good to go. 3. In this case, you might see two PSC URL outputs in the step 1 command. Both the PSC have the same URL, and it might or might not have the same SSL trust. Multiple URL with different SSL trust. This would be a easy one. On the output from Step 1, you will see two outputs with same PSC URL, but different SSL trust. And one of the SSL trust from here will match the current certificate from step 2. So this means, the one that does not match is the stale one and can be removed from the STS store. You can remove them from the CLI, however, I stick to using Jxplorer tool to remove it from the GUI. You can connect to PSC from Jxplorer using this KB article here. Once connected, navigate to Configuration > Sites > LookupService > Service Registrations. Locate this similar service ID in the service registrations and you should be good to remove it. Multiple URL with same SSL trust. In this case, after the output from step 1, you will see two same PSC URL along with the same SSL trust. And these might or might not match the output from step 2. Note down both of the service IDs from the output of step 1. Connect the Jxplorer as mentioned above. Select the service ID and on the right side, click Table Editor view and click submit. You can view the last modified date of this service registration. The service ID having the older last modified date would be the stale registration and can be removed via Jxplorer. Now, when you run the command from Step 1, it would have one output. If this matches the thumbprint from step 2, great! If not, then an additional step of updating the thumbprint needs to be performed. In an event of external PSC deployment, let's say one PSC in production site and one in recovery site in ELM, then the command from step 1 is supposed to populate two outputs with two different URL (production and DR PSC) since they are replicating. This will of course change if there are multiple PSCs replicating with or without a load balancer. The process would be too complex to explain using text, so in this event it would be best to involve VMware Support for assistance. Post the restart the upgrade should resume successfully. Since this is on 126the package, the upgrade would complete fairly quickly post the restart of the service and you might not notice the progress further. In this case, you can go back to the avinstaller.log.0 and verify if the upgrade is completed. With the release of 8.1 vSphere replication comes a ton of new upgrade and deployment issues. The one common issue is the Bad Exit Code: 1 error during the upgrade phase. This is valid for 6.1.2 or 6.5.x to 8.1 upgrade. The first thing you will notice in the GUI is the following error message. If you retry the upgrade will still fail and if you Ignore, the upgrade will proceed but then you will notice during during the configuration section. Only after a "successful" failed upgrade we can access the logs to see what's the issue. Then retry the Upgrade by deploying a fresh 8.1 and going through the "upgrade" process again and this time it should complete successfully. With the release of vSphere Replication 8.1, the upgrade path is not how it was earlier. The 8.1 vR server now hosts a PhotonOS and the upgrade is similar to a vCenter migration. In this case, you will deploy a new 8.1 vR server via the OVF template with a temporary IP and then follow a series of upgrade / migrate steps to transfer data from the old vR server to the new one. 1. Proceed with the regular deployment of the vSphere replication appliance, where you download the 8.1 ISO, mount it on a windows server and choose the support.vmdk, system.vmdk, certificate, manifest and the OVF file for deployment. A temporary IP is needed for the appliance to be on network. 2. Once the deployment is done, power on the 8.1 appliance and open a VM console. During the boot you will be presented with the below options. The 192.168.1.110 is my 6.5 vSphere Replication appliance and it was already registered to the vCenter server. Select the Option 3 to proceed with the Upgrade. NOTE: For Bad Exit Code 1 error during upgrade, refer this article here. 3. Provide in the root password of the old replication server to proceed. 4. The upgrade process begins to install the necessary RPMs. This might take about 10 minutes to complete. 5. You will then be prompted to enter the SSO user name of the corresponding vCenter this vR is registered to and it's password. 6. Post a few configuration progress in the window, the upgrade is done and you will be presented with the 8.1 banner page. That should be it. Hope this helps! VDP Backup And Maintenance Tasks Fail With "DDR result code: 5004, desc: nothing matched"
2018-04-24T20:01:16.180+07:00 avtar Info <19156>: - Establishing a connection to the Data Domain system with encryption (Connection mode: A:3 E:2). 2018-04-24T20:01:26.473+07:00 avtar Error <10509>: Problem logging into the DDR server:'', only GSAN communication was enabled. 2018-04-24T20:01:26.474+07:00 avtar Info <12530>: Backup was not committed to the DDR. 2018-04-24T20:01:26.475+07:00 avtar FATAL <8941>: Fatal server connection problem, aborting initialization. Verify correct server address and login credentials. Apr 25 09:03:49 slc2pdvdp01 ddrmaint.bin: Info: cplist::enumerate_ddrconfig ddr_info version is 5. Apr 25 09:03:49 slc2pdvdp01 ddrmaint.bin: Info: Establishing a connection to the Data Domain system with basic authentication (Connection mode: A:0 E:0). Apr 25 09:03:59 slc2pdvdp01 ddrmaint.bin: Error: <4750>Datadomain get checkpoint list operation failed. Out of curiosity, when I try to list data domain checkpoints, it fails too. <4750>Datadomain get checkpoint list operation failed. The VDP server relies upon the ost folder to perform the maintenance tasks and this folder was missing from the data domain causing maintenance and backup tasks to fail. 1. Login to the Bash shell of Data Domain. You can view this article for the steps. NFS export for "/backup/ost" added. Exit the data domain and back in VDP putty, run ddrmaint cplist and this should return the checkpoint lists successfully. This should proceed with a successful maintenance and backup tasks. SRM Service Fails To Start: "Could not initialize Vdb connection Data source name not found and no default driver specified"
In few cases, you might come across a scenario where the Site Recovery Manager service does not start and in the Event Viewer you will notice the following back trace for the vmware-dr service. VMware vCenter Site Recovery Manager application error. class Vmacore::Exception "DBManager error: Could not initialize Vdb connection: ODBC error: (IM002) - [Microsoft][ODBC Driver Manager] Data source name not found and no default driver specified"
There are no logs generated in vmware-dr.log and the ODBC connection test completes successfully too. However, when you go to vmware-dr.xml file located under C:\Program Files\VMware\VMware vCenter Site Recovery Manager\config and search for the tag <DBManager> you will notice the <dsn> name will be incorrect. What I suspect is something has gone wrong with the vmware-dr.xml file and the fix for this is to re-install the SRM application with an existing database. Post this, the service starts successfully. Hope this helps. mount the ISO on a local windows machine and then you can use the ui installer for windows to begin the upgrade phase. We will be going with the Upgrade option. The upgrade is going to be like the earlier path wherein the process will deploy a new 6.7 VCSA and perform a data and configuration migration from the older 6.5 appliance and then power down the old server when the upgrade is successful. Accept the EULA to proceed further. In the next step we will connect to the source appliance so provide in the IP/FQDN of the source 6.5 vCenter server. Once the Connect To Source goes through you will then be asked to enter the SSO details and the ESX details where the 6.5 vCSA is running. Then the next step is to provide information about the target appliance, the 6.7 appliance. You will select the ESX where the target appliance should be deployed. Then provide the inventory display name for the target vCenter 6.7 along with the a root password. Select the appliance deployment size for the target server. Make sure this matches or is greater than the source 6.7 server. Then select the datastore where the target appliance should reside. Next, we will provide a set of temporary network details for the 6.7 appliance. The appliance will inherit the old 6.5 network configuration post a successful migration. Review the details and Finish the begin the Stage 1 deployment process. Provide in the details to connect to the source vCenter server. Select the type of data to be copied over to the destination vCenter server. In my case, I just want to migrate the configuration data. Review the details and Finish to begin the data copy. The source vCenter will be shutdown post the data copy. The data migration will take a while to complete and is in 3 stages. And that's it. If all goes well, the migration is complete and you can access your new vCenter from the URL.